It's hard to believe that after almost two years of wondering what the hell happened to Daenerys's ice dragon, how Jon Snow will find out about his real lineage, or all the million other questions we had at the end of Game of Thrones season seven, we will soon be getting answers. In fact, it's so hard to believe that we almost don't believe it. Jimmy Fallon and the rest of The Tonight Show crew is with us in wondering, "How long must we f*cking wait for Game of Thrones?" 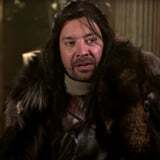 In a hilarious and brutally realistic late-night skit, Lord of House Fallon exclaims, "Winter has come and gone, and Winter has come and gone again, and now 'tis Spring and one thing is clear: shorts weather is coming." The cast jokes about having no new shows to watch, and they even point out that if the show never starts, it can never end. Sean Bean, also known as the late Ned Stark, popped in to Rockefeller Center to remind the uneasy council members to be patient. "The premiere is coming, but until then, we mustn't lose our heads," Bean quips in the clip. Watch the video above to see what George RR Martin also said about the end of the beloved show.